The last clip in particular (starting at 1:10), from my local station at Bentleigh, had me gasping. The first person crossing is foolish enough, but the second — particularly as he appears to stumble — is just seconds from death. I fail to see how anybody could be so stupid. People at this very location have been killed before — at least three in the past decade or so. You can argue that crossings should be upgraded or removed, but that doesn’t absolve people from personal responsibility for their actions. The train passed through Ardeer Station travelling at about 121 km/h [on the south track]. The occupants of the train cab subsequently sighted a pedestrian on the north track. The pedestrian was observed to be crossing from north to south. With the train about 95 metres from the crossing and travelling at 119 km/h, the driver gave a short blast on the train horn and immediately applied the emergency brake, followed rapidly by another short blast. The pedestrian was seen to look towards the oncoming train apparently alerted by the horn and then speed up her movement to cross in a southerly direction. A further and continuous application of the horn commenced about 27 metres before the crossing and was maintained until after the train had passed the crossing. 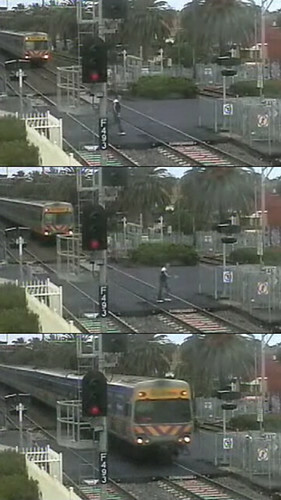 The pedestrian failed to clear the south track by about a metre and was struck by the right hand side of the front of the train at or about the southern most rail of the south track. The pedestrian sustained fatal injuries. The train was travelling at 112 km/h at impact and subsequently came to a stop 524 metres past the crossing. With the leading car stopped on the Kororoit Creek Bridge, passengers were required to alight from the rear car access doors. It never ceases to amaze me how stupid people can be around public transport. Spend any time at any crossing, especially those around stations (Try Glenhuntly Station) and you’ll see people pushing past the closed gates, running over tracks and you name it – all in the name of either crossing the road or catching the train, both of which can be done easily at a later time with no loss of life. Worse still is when the DOT gets out there and fines people for committing the offence. They always moan and groan about it, but would be the first one to complain to the government about the lack of safety if anything happened. Stupid should be illegal. I was stopped behind someone at the traffic lights one day. They stopped on the trainline. Sure there was no train coming when they stopped, but what if a train turned up and the traffic ahead didn’t allow them to proceed through?? Check – http://itissotooaword.blogspot.com/2009/06/it-would-appear-advertising-for-not.html for the pic I took of their stupidity that day. Whenever we get off at Clayton station and walk around to wait for the crossing gates to open there always seems to be at least one, if not more, idiot pushing/pulling the gate open to cross the tracks while lights and bells are sounding. Yes, we’ve witnessed a few people say something to stop this dangerous behaviour – one lady even grabbed the back of one bloke’s jumper – but the warnings get shrugged off. I figure they have to be mentally impaired in some fashion – alcohol/drugs/mental illness – to commit such stupidity. As long as there are trains and stupid people this will continue to happen. I am surprised to see crossings without the boom gates. These gates usually get one’s attention when thet are coming down in front of one’s car with the bells and lights going. In the US school busses are required to stop at all tracks and look both ways before crossing the tracks even if there is no warning being sounded. Note that it took the train described in that article 619 metres to stop from 121 km/h. My brother-in-law used to be a driver on trains for the NSW Railways, and when I asked him one day what he would do if he saw a vehicle stranded on the tracks at a level crossing, he said “Nothing. By the time you realise it’s stuck, it’s *literally impossible* to stop the train before hitting the vehicle! You just have to hope that there’s nobody in it when the collision happens!” Of course, he was driving goods trains weighing many hundreds of tonnes, but the article above shows that the principle is the same, even for much lighter suburban trains. I saw something bizarre the other morning at Glenhuntly. Boom gates down. Two trains citybound, one on the express track and the other on the all stations track, both passing cross the level crossing at the same time. A car stopped within the level crossing area, with trains passing on either side of it. Just crazy. Malcolm, the pics are at approx 1:21, 1:22 and 1:24. Paul, not that unusual perhaps. I often see cars in the middle there, though not often when trains are passing.